This is both a depressing and a hopeful time for the Forum. Depressing, because building is well under way at the old Marconi site, a short walk down the lane from Stanmore Common, and looks unstoppable at the Royal National Orthopaedic Hospital site. These are unimaginative, unsuitable developments that drive a great wedge of suburbia into the green belt. Hopeful, because messages and deeds from the Council now look more promising. The Green Belt Management Strategy, adopted by the previous administration in March 2006, has many specific goals to which the Council and its officers can, I hope, be held. To take some examples: “Resurface and improve the fencing at the Stanmore Common bridleway to reduce the impact on conservation areas”: fencing improved in 2007/2008; bridleway resurfaced in 2008/2009. “Support the work of the voluntary wardens and groups in conserving and protecting the sites of SSSI’s, Sites of Nature Conservation Importance and Ancient Woodland on Council owned land”: co-ordinated management plans to be in place by 2006/2007. “Work in partnership with external organisations to encourage the protection and maintenance of the existing RAF Bentley Priory site”: to be complete by March 2011. “Restore and protect the historic ancient woodland in Pear Wood”: to be complete by March 2011. Perhaps most important of all, there is a council officer, Andy Parsons, who is responsible for implementing the strategy and who we can hassle when deadlines loom. The Council launched the Biodiversity Action Plan process on July 27th at the Civic Centre. The meeting was chaired by Councillor Eileen Kinnear and addressed briefly by Councillor David Ashton, both of whom seem sincere in wanting to preserve green spaces. In particular both David Ashton and Steve Woad emphasized that funds for the Green Belt Management Strategy and the Biodiversity Action Plan were ring fenced and could not disappear into the Council’s financial black hole. Anna Cohen, the Biodiversity Action Plan Officer, has been in place since April and is enthusiastic and knowledgeable. If there is one worry it is that the Council may concentrate its plans and suggestions on the existing Nature Reserves, since they are already in good condition and allow biodiversity goals to be ticked as achieved without the council actually doing anything to make things better. We must make sure that at least half the Council effort goes on the many sites it owns or controls that are not within our remit and where there is considerably more scope for improvement. Autumn is a time for Spiders many species come to maturity at this time and so it's a great time to go and look for them. 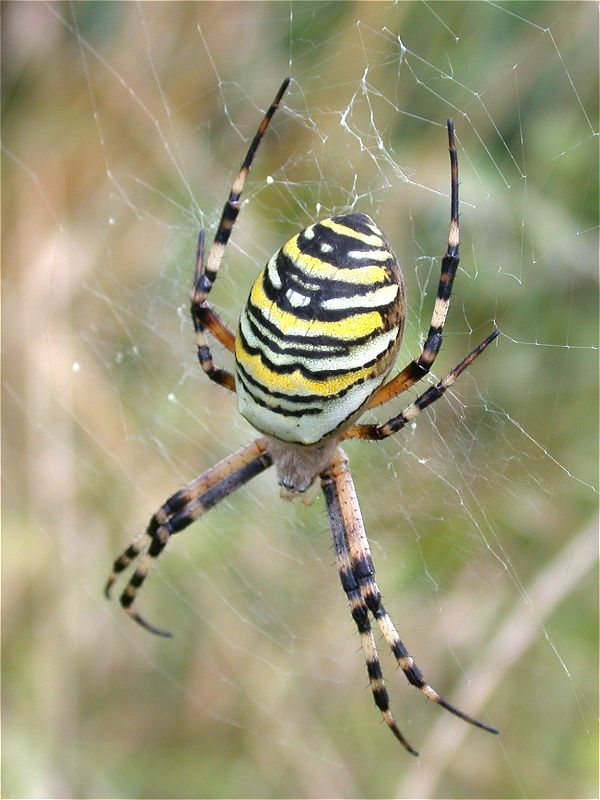 One spider to particularly look for is the Wasp Spider, Argiope bruennichi. This is a large spider, large as a garden spider with a huge yellow, black and white striped body. It really is unmistakable. It is an orb web spider making webs low down, near ground level in undisturbed grassland or other low vegetation. It has been in Britain since 1922 in only a few sites and is now starting to spread. I saw my first ones at the Wetland Centre, so keep your eyes open for this striking little beastie. A further planning application has been made to demolish farm buildings and construct 10 dwellings; refurbishment of house and dairy with associated entrances, roadways and landscape works. The LBH ref. is P/2203/06/CFU. Letters of objection should be sent to Harrow Council, Planning, Garden House, 5 St. John’s Road, Harrow. HA1 2EY by 6/9/06. Stanmore Common is in an overgrown state, little practical work has been done since winter as the heathland heritage events have taken precedence. These events have had good attendance e.g. butterfly and orchid events and poor attendance, e.g. bat event and reptile workshop. Ironically heathland restoration is now proposed for the Common but no heathland invertebrates can be found. The Orchid count was not done but numbers were again low. Heathland; restoration or not? Heathland restoration involves bulldozing clearings of top soil, rolling the it into bunds and if necessary re-seeding the underlying soil with heather; a dramatic process, and one which has been recommended for Stanmore Common.This is a contentious issue. How far do we want to take back in time a piece of land? Does the amount of damage that would be incurred equal the benefit of seeing more heathland plant regrowth, a reduction in bracken and large sections of the common taken back to an earlier succession state? If one cannot find the old heathland invertebrates, is there any point in restoring heathland p1ant growth? These are questions I have no answers for. At the AGM in May it was announced that Steve Bolsover would be standing down as site warden after many years of commitment and good husbandry to take on the more rigorous role of chair of HNCF. I could not think of a more able replacement for Maurice, who sadly (for us) retired from that post this year. I agreed to take on the post for a year and was voted in at the AGM. I have the same problem as with my previous tenure, some years back, in that my professional commitments continue to impinge on my available time. Fortunately my wife Gill has agreed to be my representative at least for some of those times when I’m not available. The Open Day (July 16th) was a huge success, with many visitors to the site, some new, and some very familiar faces! Steve had kindly accepted my invitation to lead the guided walks, and Gill (Lewis) had once again opened the Church for the benefit of visitors. We were graced with superb weather. For me, of note were the Purple Hairstreaks in the cemetery extension in Elms Road (identified by Paul of HNHS), and the flowering Saint Johns Wort. This seems to be a good summer for butterflies - Comma, Speckled Wood, Meadow Brown and Holly Blue were all noted. I’m sure everyone took something away with them - be it a sighting or anecdote from the guided walks. Thanks, as ever, to the committee members who worked so hard to make the day work, especially Betty and Joyce for the food, and Bentley Day Centre for use of the hall. Dave Bolton has been cutting back bramble and mowing the paths regularly this summer together with the usual litter picking. There is little water left in the ponds but there are still tadpoles to be seen. The drought has meant that large cracks have appeared in the ground and leaves are dropping from the trees. The patch of sedge is also greatly reduced. The usual tasks have been undertaken this summer; bracken pulling and bramble reduction. The bracken, after three years of trampling and pulling, is showing signs that this attention is finally paying off. Less stems regrow after the first pull in early June and they are smaller. In between the work some attempt has been made to monitor the butterflies. On our summer walk we saw Marbled Whites in three separate areas and the highlight of the year was the sighting of a Silver-washed Fritillary on the central path. 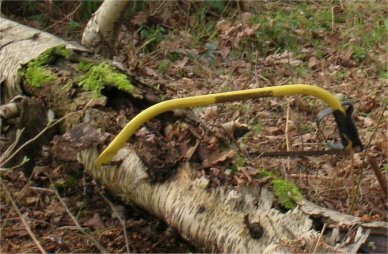 Five BTCV visits have already been booked for the winter work programme which will be aimed at clearing another area of bramble and sapling birch.